China is joining the world’s leading technological powers as its research and development capabilities mean it is leaving behind its previous status as a second-tier industrial economy, the International Monetary Fund believes. The world’s second-largest economy has successfully moved from basic manufacturing into cutting-edge industry, challenging the traditional view of emerging market economies as technological followers of the West. “Even though until recently much of the production of knowledge and technology was concentrated in a small number of advanced economies, China and Korea have now emerged as significant contributors to the global technology frontier,” the IMF said in its World Economic Outlook. “Therefore, there may be scope in the future for spillovers from these new innovators to the traditional innovators” – with Western firms learning from China’s new technological developments, reversing the traditional flow of knowledge. 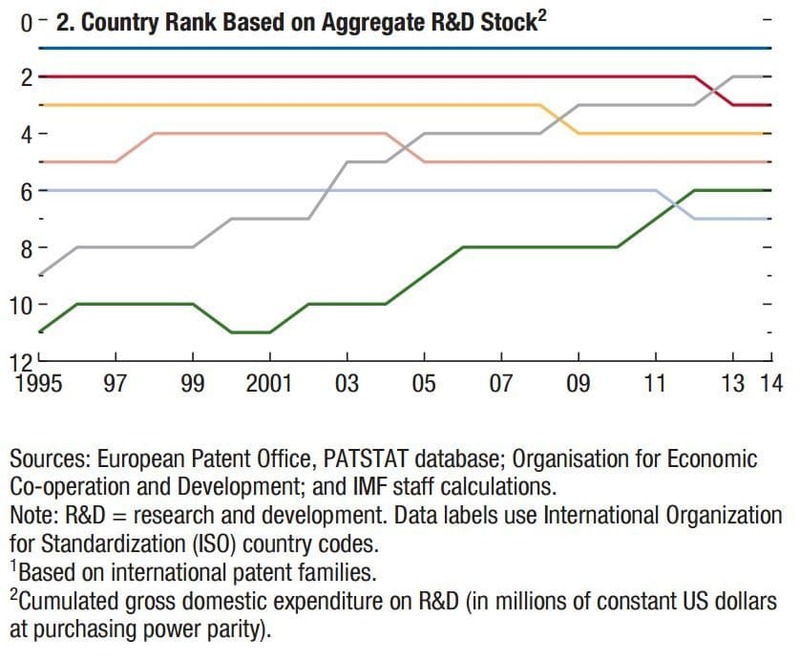 Since 2000 China has overtaken the UK, France, Germany and Japan in terms of cumulative spending on research and development (R&D), leaving it second only to the USA. Donald Trump has expressed concern that the US risks falling behind China, a fear which will receive a boost from the IMF’s finding that world’s most populous nation is now a top-five powerhouse in R&D in several tech sectors, including electrical and optical equipment. President Trump as well as some business leaders have accused China of unfairly growing its tech sector, with a combination of theft of intellectual property, blocking US firms out of the market, and supporting companies which have little respect for individuals’ privacy. Companies including Facebook have been blocked from the country and Google has only a very limited presence, allowing China to build its own social media and search giants such as Baidu and Weibo, which face greater censorship from the authorities. Amazon has struggled to grow with Alibaba taking a commanding position in online retail instead. Apple is a rare example of a US tech giant which has access to the Chinese market, as it is allowed to sell its gadgets – which are made in China – in the country. But its software services differ. For example, the iCloud, an online data storage service, is heavily encoded in the US and Europe in an effort to guarantee users’ privacy. But it has had to set up a separate cloud in China which the state can more easily access. » IMF warns global economy "highly vulnerable"